October | 2011 | Killed in a Smiling Accident. 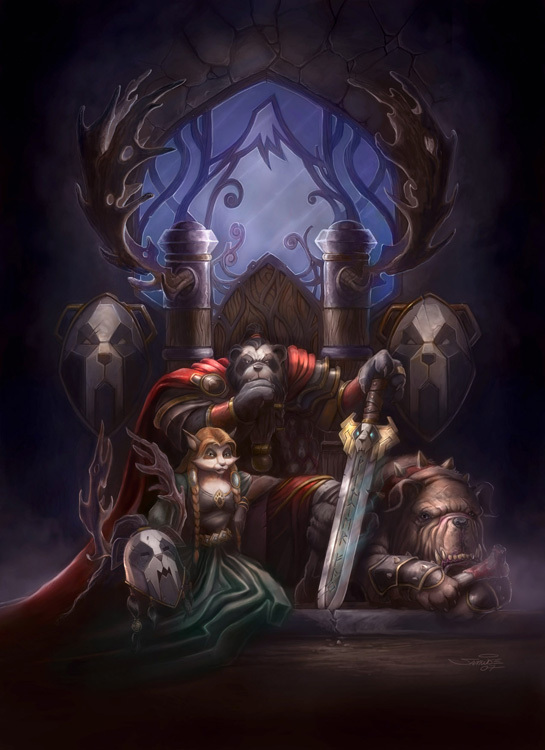 If you haven’t already read Cynwise’s deeply splendid look at the Pandaren and the influences involved, I’d highly recommend you do so. Stemming from that post is a link to Samwise‘s gallery which includes concept images of the Pandaren, and which upon closer inspection also gives hints –to those who may be interested– as to a couple of possible appearance options for the female of the species. Specifically here, here and here. This entry was posted in melmoth, mmo, wow and tagged melmoth, mmo, wow on October 31, 2011 by Melmoth. It seems that every mob now stuns during combat in Lord of the Rings Online’s Rise of Isengard expansion. I can’t begin to describe how annoying and pointless this feels. What? Oh yes, well, I suppose I could at least try. My experience with combat in this latest expansion has been one of general annoyance. I’m wondering whether my frustrations are the result of the change in how character stats work, such that my character has yet to accumulate enough newly itemised gear in order to get back to the level of power she once enjoyed. I do know that Wardens are also suffering a little in this expansion (admittedly it’s the sort of suffering the Sultan of Brunei would experience if he found he’d lost a five pound note), something of which Turbine is aware and intend to address in a forthcoming patch. Regardless of my class-specific woes, the number of misses, evades and parries my character experiences when in combat with basic, even-con mobs, has reached quite tiresome levels. The peak moment of heroism was last night, where my character snuck up carefully behind a stationary guard, took careful aim at point blank range, and then powerfully launched a javelin into the ground at the guard’s feet, with my character presumably smacking their forehead on the up-ended spear shaft with the momentum of the follow through. While my character staggered around clutching their head, the guard –after he’d managed to stop laughing– understandably decided to retaliate. Of course what actually happened was the words EVADE popped up on my screen, and I wondered what level of martial arts training this hillman had undertaken to be able to dodge a javelin thrown at his back at point blank range while he was seemingly oblivious to my character’s presence. And then I started to wonder why these supernatural ninja warriors hadn’t already taken over the lands of Middle Earth. Do I need to talk about the giant slugs which can parry my attacks? I mean, is it really that hard to define an inheritance class of mob, called slug, with the Has_No_Blarmed_Chance_Of_Parrying field set to TRUE? Or perhaps it’s just an indication that it’s time to sharpen the ol’ sword, when a slug successfully uses an eyestalk to perform a parry and counter-riposte to your attack. The reason for noticing all these niggles is that I’m constantly given time to contemplate them mid-fight, every time an enforced pause is foisted upon me. I’ve mused on the stun as a mechanic before, but the ironic situation is that every time I’m stunned in combat I’m simply being given yet another opportunity to mull and fume over the fact that there’s nothing to do when I’m stunned. Every stun is now a short advert break for how annoying stuns are. Quite frankly I’m seriously considering that this is all just a prelude to Turbine slipping in adverts for the LOTRO Store during the intervening period. Slug parrying getting you down? Visit the LotRO Store today and pick up a Slug-Be-Gone salt shaker legacy for your legendary weapon of choice, only 250 Turbine points! What is the point of the stun? What?! Kif, I’m asking you a question! In the past I imagine it was a numbers game: someone, somewhere, had a spreadsheet which showed that if you halted play for two seconds every fight, and added all the delays over all the many many fights in which the player would engage, that you could add another day or two to the /played time for a character, which when multiplied by a healthy number of subscribers would probably equate to a second kidney extension to the CEO’s swimming pool. In a free-to-play game the point becomes more about the fact that it’s unavoidable and, barring the odd class with a long cooldown ability, unbreakable, therefore I have no control in this; it enforces the realisation that, at any point, the game could simply choose to win, and therefore the only reason you experience victory at all is because the game lets you. It doesn’t add any level of peril, because most fights are never anywhere near the level of challenge where a stun might stall your defence for long enough that the mob could kill you. And even if it did, even if the mobs were clever enough to whittle your health low and then pop a stun and finish you off, what of it? All that shows is that the only way for the game to win is to STOP YOU PLAYING YOUR CHARACTER… If you really want me to stop playing your game, just say, I’ll go and find another one. Stuns like this, used consistently and for no tactical reason, are just one of those supreme examples of blasé thoughtlessness that we often see in MMO combat design. Or so it seems. I’d be very happy for someone at Turbine to explain the stun mechanic to me, to outline why it adds anything to the combat, anything at all, except for extreme annoyance and frustration and downright hair-tearing incredulity on the part of the player. Alas, my only –admittedly cynical– hypothesis for an explanation so far is something along the lines of “This is the sort of tedious trite crap we’re going to be pulling over and over again at the end game, so we thought we’d get in there early and build up your tolerance to it”. This entry was posted in lotro, melmoth, mmo and tagged lotro, melmoth, mmo on October 28, 2011 by Melmoth. Now what would be really interesting is if, say around 20.12.2011, World of Warcraft announced that it was going free to play. Lord of the Rings Online was still offering standard and lifetime subscriptions right up to the point that it announced it was going free-to-play; getting your most ardent fans to agree to sign-up for a year mightn’t be a bad plan if you were going to open the game up to all, for ‘restricted content’ free play at least. In addition, a forthcoming expansion which, potentially, could be seen as specifically targeting a younger audience, might work better if the subset of younger players who couldn’t normally afford a regular subscription were able to play for free, and then pay smaller amounts for the combat pets, mounts, and other items they were interested in. Now, if World of Warcraft were to add a cosmetic item system, something which has already proven incredibly lucrative in a game such as LotRO, then you might consider it as further evidence that an in-game WoW Store was a distinct possibility, and free-to-play often goes hand in hand with an RMT store. Of course, realistically you’d expect Blizzard to test the RMT waters first, perhaps with a small vanity item that could be bought with real money and then traded on the game’s auction house to other players, as a finite controllable experiment. Don’t take this as some sort of proclamation as to what I believe is going to happen, but it is an interesting thought experiment to consider whether –what with the recent decline in subscriptions of their aging game, along with a core audience which seems dissatisfied no matter what they do– Blizzard would entertain the idea of opening World of Warcraft up to the pocket money demographic. This entry was posted in melmoth, mmo, wow and tagged melmoth, mmo, wow on October 26, 2011 by Melmoth. The Pandarens live in peace and harmony, and that means NO MONEY. Yup. Gold GOES AWAY ENTIRELY. The Auction House now deals in barter and karma. Do a nice thing for someone, you get a little karma you can spend. You can even help out animals and monsters for more karma. Blizzard just killed the whole gold farming industry. Now you’re going to see bunches of level 90 rogues jumping around trying to do nice things for you. I’m not sure what I’m looking forward to most, Gevlon’s head exploding or the term ‘gold farmer’ becoming obsolete and replaced entirely with ‘karma farmer’. Probably the latter in a future expansion when new camelid races are added, as the question would arise of why Blizzard would release a statement about a contentious incident involving one of those played by someone from northern Italy named after the US President acquiring protective yellow fruit nightwear? If you’re playing along at home, that’s ten points if you said “to calm a Parma llama Obama karma farmer banana pyjama armour drama”. This entry was posted in games, zoso on October 25, 2011 by Zoso. This entry was posted in melmoth, mmo, tftd, wow and tagged melmoth, mmo, tftd, wow on October 24, 2011 by Melmoth. Sometimes it’s good to be reminded as to just how confusing and daunting MMOs can appear to a person who has never played one before. City of Heroes is good at doing this because even though I’ve played the game before, and even though I’m fairly familiar with many of the tropes and systems with which we associate MMOs, CoH has added many new systems since I last played regularly, and it often does things a little bit different to the MMO norm anyway. City of Heroes now has Trials, a sort of dungeon run restricted to one location, rather than the multi-mission, multi-location story arcs of the Task Force group content. I guess you could see the Trials as Not-so-Public Quests, in the fact that you go to an instance with a fixed group, but the challenges of the event dynamically update as your group completes each stage. At the lower levels the main trial is Death From Below, or ‘sewer trial’ as it is often referred to among the CoX cognoscenti. You can queue for the trials through a LFD-like interface, but the CoH crowd, being the more sociable and old-school lot that they are, generally seem to prefer organising a group through global chat channels such as Global and Help, and then queuing the whole group up at once, whereupon it is instantly ported into the instance. I say instantly, but of course it takes differing amounts of time for people’s computers to load the map, and this is where my problems began. Having been the first into the map, I decided to have a quick look around the start, where I quickly found a helpful Longbow NPC who offered to train-up my character if they required it, as well as offering a number of other services. No, not *those* kind of services, longbow is not a euphemism. Since the XP gain is so mind-bogglingly delicious in these trials, or certainly this specific trial at these low levels, the developers have helpfully added NPCs at various stages through the run who will train-up your character, so that you can gain levels and get your new skills without even having to wait to the end of the current instance run. Nifty!, as I believe the loquacious kids say. One of the other services offered, however, was to switch to a different character build. This was new to the game since I’d last been there, and looking around and not seeing the rest of the group yet, I decided to have a quick play with swapping my build. Having switched builds, I found myself with no powers whatsoever on my hotbar. Not to panic, a quick word with the NPC about training and I could see that I was essentially a level one character, with seven-or-so levels worth of powers and slots to pick, exactly as if I’d just initiated a character respec. It makes sense: when you want to change character builds, you’re generally going to want to use a different build. Okay, admittedly in a game like CoH I can sort of picture those builds being categorised as ‘AoE Damage’, ‘More AoE Damage’, ‘The Same AoE Damage But With Different Colours’ and ‘Defensive Build With Contingency for… Nah, Just Kidding, This One Does Urethra-Loosening AoE Damage Too’, but in reality there genuinely are different ways to build most powerset combinations, mostly for damage, but control/defensive builds are a valid consideration; not to mention the fact that you use an entirely different set of enhancements (the game’s item/e-peen/advancement equivalent) for each build, which with the game’s crafting system giving a wide variety of enhancement ‘sets’ (each of those sets giving interesting bonuses and procs based on the number of enhancements of that set slotted in your character’s powers), means you can add quite a variety of customisation to a character. But if we’re honest, it’s mainly about the AoE. It was, of course, while staring at a blank character build that the rest of the team turned up. Fair enough, I wasn’t sure what I wanted to do with this secondary build anyway, so I just swapped back to my origina… ‘You Must Wait Fourteen Minutes Before You Can Change Builds Again’. What followed can only be described as a frantic grab for powers as the rest of the team opened up the sewer doors and began dispensing AoE justice – the best kind of justice. It was like being late for work, where you dash around the house grabbing whatever you think may be necessary, nay, whatever immediately comes to hand, such that you turn up to work with your trousers on back-to-front, and a briefcase which contains a pair of socks, your wife’s epilator (buzzing), one slipper, a packet of sultanas (mostly emptied out into your bag), three dishwasher tablets, half of yesterday’s broadsheet, and your cat, who looks at you with the hate-filled eyes of one who has been unceremoniously dumped in a dark bag and forced to fight for its life with an aggressive epilator. I accepted the powers that I’d frantically grabbed, and jumped into the action. We completed the instance without any trouble, probably because with eight players all blasting away, there’s not an awfully great challenge to the whole affair, even if one of those players is standing at the back and using the mutated macramé power they mistakenly picked – knotting particularly vicious looking cushions to throw at the enemy, while hoping that nobody else on the team notices. It’s interesting how such a simple thing can cause trouble. I can’t honestly say whether it was my ‘yeah, yeah’ MMO attitude to clicking on buttons, or whether there indeed wasn’t a prominent warning to let the player know that they wouldn’t be able to change builds again for fifteen minutes, BEFORE they committed. Regardless, for anyone who doesn’t really understand ‘alternative builds’ in the context of MMOs, it might well cause a lot of confusion and frustration for the new player to find themselves locked out of their main build for fifteen minutes. Either way, it reminded me of how much I take for granted in MMOs these days with respect to my inherent knowledge, and how hard it must be for developers to truly place themselves in the shoes of the new player, to weight their tutorials, instructions and warnings so as to give those who are inexperienced the best possible chance, while at the same time not hindering the ‘yeah, yeah’ crowd of MMO regulars. Now if you’ll excuse me, I have a staff meeting and I need to quickly pop a tie on Mr Tiddles and brief him on how to act like another software engineer. Mainly it involves instructing him to only purr when a particularly interesting algorithm is displayed on the projector screen, and to not lick his bum at the conference table (etiquette dictates that such activity is generally to be confined to one’s cubicle). Having his hair attacked savagely and randomly by an epilator was a good first step to a disguise, however; he will do well here. This entry was posted in coh, melmoth, mmo and tagged coh, melmoth, mmo on October 21, 2011 by Melmoth. Like fresh snow falling on the frozen river, there are those of us in the MMO genre who settle but briefly, and are prone to drift when winter comes. Yet we mustn’t forget that this genre is built in layers, and beneath the drift are those whose attentions lay across a single game, their focus forming a frozen foundation, their passion packed solid around its structure; we can find within this silent stable scene reflections and echoes of that once tumultuous mighty river, which carried us along to unseen destinations in a frothing frenzy of chaos and excitement. Still, the genre does indeed seem frozen to many of us who drift. With the onset of winter, the silence descends. The thunderous gods of the waters stand muted and still, an eerie quiet envelops the thickly blanketed wood through which the river runs: all the harsh blows of sound are deadened by that shield of snowy silence. Exuberance hibernates within her den, curled up in quiet content alongside Clamour and Activism. This winterish discontent causes a melancholy view, all is frozen and still, all is bland and featureless. The blankness of this cold carpet canvas, which with numbing despotism across the genre lies, yet leaves us with a small fire of faith, carefully kindled, towards which we can hold out the hands of our hope and keep them warm: the great thaw will eventually come, and with it a new world appears, reinvigorated and renewed. I certainly find it hard to weather these winters in the land of Blog. Inspiration most often comes from playing: interaction and frustration are the foodstuffs upon which my muse feasts, before dumping her digested diatribes upon the page for your consumption. Yes indeed, reading a post equates to eating muse manure. And it is not adversity which prevents me from playing, on the contrary, because adversity is the Beef Wellington of muse foodstuffs: a hearty fare which fills to bursting point the stomach of seething satire. No, it is the bland formulaic mediocrity which starves the muse, rice and curds which neither offend the palette nor delight, but provide the base, the nutrition of entertainment, and nothing more. It is docile entertainment. Without passion. Lobotomised. I found the same when playing through the two DLC modules for Dragon Age 2 recently; having finished them both I could not deny that I had been entertained –entertainment had occurred– but it was the sweaty discomfort of sitting in an entertainment sauna, as opposed to the fiery consuming passion of being burnt at the entertainment stake. Winter is here, and there’s barely enough fuel to cook the muse a modest meal, let alone build a pyre to ignite the imagination. Here’s hoping that an infusion of vernal freshness into the genre is not far behind. This entry was posted in ennui, melmoth, mmo and tagged ennui, melmoth, mmo on October 20, 2011 by Melmoth. News today that Microsoft is intending to patent a celebrity shaping system for their search engine Bing. Which quickly leads us to wonder which MMOs would be turned up when the term was searched for under certain celebrity personas. So we programmed a quick rough’n’ready plug-in for the KiaSA Captcha AI and tried out a few random personas. Searching for ‘MMO’ when using the Naomi Campbell persona turned up EVE Online, possibly based on the fact that they’re both overly interested in their own appearance, while regularly turning around and biting the hand that feeds them. World of Warcraft was, predictably, returned in many results. The persona of famed temper-tantrum prone singer Björk being a fine fit for a large section of the game’s populace, and the ‘once young, fun and whacky, but now old, tired and should probably just retire gracefully’ Robin Williams persona also provided a solid hit for the game. We had to tweak the plug-in slightly when Patrick Stewart’s persona returned Star Wars: The Old Republic, and Mark Hamill’s returned Star Trek Online. Now Stewart returns DC Universe Online, while Hamill’s persona gives Marvel Super Hero Squad Online. BBC presenter Clare Balding‘s persona returned LotRO as the top result for MMO searches, which we assume was due to her being charming, homely, and fanatically interested in horses to the point of distraction. A search using the Lady Gaga persona returns City of Heroes as a top hit, probably due to the fact that everyone likes the game, but few people seem to openly admit it. Plus Lady Gaga could probably learn a thing or two from the crazy-mad outfits that can regularly be seen on display in Atlas Park. The Richard Nixon persona always returned a nostalgia tinted version of EQ that never really existed, no matter how much we tried to refine our search terms. A Sasha Grey persona? My word, how did that get in there? Regardless, although it’s probably not one that would be used from work, for an MMO search it returns Rift. Associations seem to revolve around a burst of popularity, a sudden realisation that you’re the best (in a sea of mediocrity) at something which is of only passing interest to the fans of your genre, followed by a gentle descent into obscurity. And the persona for renowned flip-out maniac Christian Bale returned Hello Kitty Online. Hmm, well we’re still ironing out some bugs in the KiaSA Captcha AI Search system, but as a first attempt, we’d say it was an unqualified success. This entry was posted in melmoth, mmo, zoso and tagged melmoth, mmo, zoso on October 19, 2011 by Melmoth. The juicy soundbite is extracted from a wider interview and sounds a bit arrogant on its own, especially as he says earlier “One of our core values, as an organisation, is humility”. In context he’s talking about that fourth pillar, the story in The Old Republic, and how it adds a greater sense of depth and purpose; the quote continues “… there’s a real sense of purpose to everything”. I’d agree that MMOGs can imbue numbers with more significance than single player games, though I’m still a little sceptical as to how a truly massive game can maintain the focus on one player; it’ll be interesting to find out how SWTOR does it. This entry was posted in games, swtor, zoso on October 18, 2011 by Zoso. I was outraged while playing Deus Ex: Human Revolution to be subjected to a terrible bug. During a shoot-out I was pinned down by automatic fire emerging from a blank wall. Obviously there was an enemy soldier behind the wall shooting straight through it; were it was another player I would’ve assumed malicious use of a cheat, but as it was just the AI I gave it the benefit of the doubt. I was all set to make a post starting “Dear Sir, why oh why oh why oh why etc.”, but couldn’t let go of the right mouse button or I would’ve stopped hunkering down in cover and been shot. On the off chance, I loosed off a few bursts of my own towards where the bullets were coming from, and was slightly surprised to see blood splatters, then the body of a solder materialise from thin air as his cloaking device failed. It wasn’t a bug at all, it was an invisibility suit; I wish the game had warned me, though that might’ve slightly reduced its effectiveness. I should probably be thankful that the tactical decision of the stealthy enemy was to stand completely still in one place shooting at the boxes I was hiding behind (and equally thankful that those boxes, like all boxes in cover-based shooters, were conveniently packed with concrete, iron plates, kevlar and other composite armours capable of withstanding any projectiles short of an artillery barrage), as if he’d tried something as crazy as “walking around the boxes (while completely undetectable)” I would’ve been in trouble. This entry was posted in dxhr, games, zoso on October 17, 2011 by Zoso.